….Amtgard is a national organization that forms groups that allows teens and adults to re-enact medieval battles in public parks. Marie Cozby, 31, known as Ivey MacLoud in Phoenix Tears, is in the midst of her six-month elected term as monarch of the group. Other reenactment groups nearby include Western Gate in St. Louis and Cursed Prairie in Peoria. 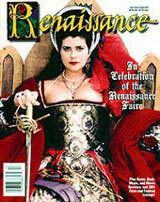 Cozby moved to Illinois and switched to Amtgard, in which her husband, John, was involved, from another reenactment group, the Society for Creative Anachronism. Amtgard incorporates more fantasy than the SCA, which performs in a more historically accurate way. Still, Amtgard has a rulebook and the warriors have to play by those rules. “Our officials are like walking handbooks,” says Brandon Hayes, an 18-year-old who joined Amtgard last year. His battle name is Bynta and he’s a level II assassin (levels are based on battle attendance). Oh, and there aren’t just warriors. Belly dancing, singing and songwriting, jewelry-making, and sewing the “garb” are only a few of the many desultory aspects that can be either a huge focus or intricate detail of the reenactment. Cozby makes “garb” to sell on her Web site, www.iveywear.org, and has held the name Ivey since she was 17 years old and living in Utah. “Everybody here is really friendly. There are a lot of people with different lives, but we all have something in common, and we all want to be here,” Cozby says. The wizards, monks, druids, squires, warriors, assassins, pages and other categories are just as varied as the people who play them. Among the dozens of re-enacters are a firefighter, employees of Best Buy and Arby’s, a cook, and a flower delivery man. April Bracco, is a 19-year-old graduate of Springfield High School who got involved with Amtgard a couple of years ago through friends. She goes by Red at Phoenix Tears — no last name…. Amtgard battles range from ditch fighting to jugging. Ditch fighting is when two teams line up and face each other and attempt to “kill” one another. A kill can come from being hit twice on the same arm, once on an arm and once on a leg, and in the front or back. When one team wins, the first person to die from the winning team switches sides, until the teams are heavily unbalanced. Jugging, taken from the movie “Blood of Heroes,” asks two teams to attempt to take a dogskoal, a simple white object in the shape of a cross, from the middle of the field and to a goal without being killed — in 100 seconds or less. Here, being dead simply means kneeling with your sword above your head for 15 seconds before resuming the fight…. Amtgard in Springfield meets by the tennis courts at Lincoln Park from 1:30 to 5 p.m. Sundays. Everyone is welcome, families included, and clothes and weapons are loaned for free. The Society for Creative Anachronism Inc. is accepting applications for the position of Editor for The Compleat Anachronist.. The Compleat Anachronist is a journal published four times a year. Each issue is approximately 60 pages long and focuses on a single topic relevant to the time period 600 C.E. to 1600 C.E. The single-topic format gives readers an opportunity to review a subject in much more detail than Tournaments Illuminated, a Kingdom Arts and Sciences publication, or a local newsletter can provide. The Editor is responsible for oversight of all aspects of issue production, including recruiting authors and reviewers, manuscript development, as well as submitting quarterly reports to the Board of Directors and the Publications Manager. A team approach to issue production is encouraged to assist in effective and timely management of the publication. The Editor may recruit a support staff, including assistant editors, graphic artists, and other assistants. The Editor needs to either be, or have on staff, a graphic artist with access to and experience with a computer running Quark or InDesign and the ability to export files to high resolution PDF format. Contributing authors are generally responsible for providing their own illustrations, photographs or other artwork, but it is helpful for the Editor to develop a pool of artists to assist authors if needed. Qualifications for the position include excellent written and oral communication skills, leadership skills, the ability to prioritize tasks and meet deadlines, and strong computer skills. Professional experience in editing, design, art direction or desktop publishing and prior experience in an SCA Chronicler position are desirable, but not required. The position requires approximately 20 to 35 hours per month (this includes recruiting authors, screening manuscripts, proofreading, layout, correspondence, and online reviewing). The deadlines to get the finished layout to the printer are 15 December, 15 March, 15 June, and 15 September. The issues are mailed quarterly in January, April, July, and October. Reasonable expenses are covered by the Corporation and may include: paper, printer cartridges, stamps, and a post office box. You will be asked to submit an expense report, with receipts attached, to receive reimbursement. The Editor also receives a small stipend from SCA once an issue is completed. Résumés must be received by September 30, 2009. The incoming Editor will begin training with the outgoing Editor in mid-October 2009 in preparation for taking over the position in January 2010. Questions regarding the position may be directed to Dori Andrepont, Publications Manager, via telephone at (661) 466-6805, or via e-mail at pubmanager@sca.org . He admits he's an anomaly, but insists there is no reason men can't belly dance as well as women. "We all have hips and legs," he says. The fortyish Galbraith lives in Hamilton, (Ontario, Canada) but teaches a dozen classes a week in Guelph, Waterloo Region and Stratford, a geographical zone he says has gone crazy for belly dancing. Seen at his class at Blue Skies Yoga on Victoria Street North in Kitchener, Galbraith seems out of place in a studio filled with willowy women. First he provides them with a woven hip belt that's loaded with giant tassels. This is a beginners' class and he wants them to feel the music and the sense of history as their tassels bounce and sway with each hip thrust and twirl. Galbraith discovered belly dancing in 1994 at a Pennsylvania event held by the Society of Creative Anachronism, a group that re-enacts historical events. Thousands of enthusiasts had gathered for the annual Pennsic, where they play out fantasies of recreating history. One evening as he walked by a campfire, Galbraith says, he was mesmerized by a group of belly dancers moving to the beat of drummers. They pulled him in to dance and the next two hours flew by in a dreamy haze of music and movement. He had no idea that dance was about to change his life. A veteran Toronto Sun reporter, he would soon trade pen and notepad for turban and sabre, reinventing himself as Valizan, a 14th-century Arab from Morocco. The alternative was to take private lessons, so Galbraith signed up with the FatChanceBellyDance Studio, based in San Francisco, where he learned a fusion form of Middle Eastern improvisation called American Tribal. Galbraith recently became the first male to graduate from FatChance's teacher training course and today he is both a teacher and performer. His three-person troupe, Shades of Araby, performs at public events and weddings. …Amidst the great mountains of the West, nestled within the confines of the valley, lives a people dedicated to the study of the art and history that is the Middle Ages. Courtly dancing and dangerous fighting rule their time, as they come together to share their love for a time long since past. Mikkelson joined the society in 1981. When he came to Cache Valley in 1990 one of his first priorities was seeking out the society locally. Changes in the group’s size tend to happen, but the fundamental purpose remains as the years go by, Mikkelson said. Belonging to the kingdom encompassing much of the mountain west known as Artemesia, the Cache Valley chapter, Cote du Ciel, contains members in a wide variety of interests and age. Karen Chrysostom found her interest in the society through her husband. His desire to join did not rub off on Chrysostom until their first encounter with the people involved. As the keeper of the keys, or seneschal, Chrysostom maintains the affairs of the group. She is the one who signs the contracts, acquires sites for events and maintains the post of regional representative. One of many meetings takes place at the historic Whittier Community Center on the fourth Wednesday of every even numbered month, courtly dancing. Group members take part on a volunteer basis, all happenings take place because of the hard work and dedication of those who simply love history. The event, as a schola, will feature several classes in medieval topics such as chian maille armor making, fencing (yes, with swords), dancing, pewter casting, Galileo's astronomy and even how to write and Elizabethan sonnet (in case you needed to impress that special someone), just to name a few. There will also be a sword fighting demonstration and games, including one game called Baron Munchausen which Bogard will be leading. "My dear Baron, tell us about the time you fought off the entire Spanish Armada with nothing but a spoon," Bogard said demonstrating the game. The object of the game is to come up with the most outrageous story. Participants at the event will be dressed in medieval period clothing ("garb"), and doing so is encouraged for guests as well. Loaner garb will be available at the event in limited supply. ..
"S.W.O.R .D. was founded about two years ago," Arthur Bogard said. Bogard is both the vice president of the club and the Seneschal (like a club president) for Gleann Iariunn. Both S.W.O.R.D. and the SCA have fencing and heavy weapons combat, though they use rattan (it's a kind of bamboo) weapons for the heavy fighting instead of sharp metal. The armor is real--the swords are not--because it is a sport and one wants to be able to party with their friends after a well-fought battle, not mourn their untimely demise…. The Bardic Circle sat around a crackling hearth fire, flipping pages of their photocopied songbooks to find the words for "Garryowen," an old Irish drinking song from Limerick. Their bellies full of corned beef and soda bread and their voices melodic and clear, the men, women and children began the upbeat tune, tapping the 250-year-old floorboards inside Schifferstadt Architectural Museum's kitchen. Steaming slices of rosy corned beef, Irish soda bread studded with golden raisins and apricots, butter and white bread were spread out on a table in front of the hearth, where a black pot of cabbage bubbled over a wood-fueled fire. The Bardic Circle of Highland Foorde, a local chapter of the Society for Creative Anachronism, met on Saint Patrick's Day for its bimonthly meeting. The circle gathers at Schifferstadt, an 18th century German home and museum on Rosemont Avenue in Frederick, to share ancient poetry, music and literature in the medieval tradition as "bards" — the people who once kept art, history, music and literature alive in Celtic Ireland, Scotland, Wales and France. The Society for Creative Anachronism — an educational nonprofit group whose members research and recreate the Middle Ages in present time — includes Frederick, Washington, Allegheny and Garrett counties in the "barony" of Highland Foorde…. As the evening wore on and more logs were laid on the dying hearth fire, the group of mostly Frederick County residents sang about Molly Malone selling her cockles and mussels ("Alive, alive oh! "), "Lilli Bulero," a 17th century Irish Protestant song, and shared Irish folktales about sea gods and heroes. As members of Highland Foorde, Ruth Bryant and Ed Mordan also take on and research medieval personas and special areas of interest. Bryant, the group's leader, said she has an interest in sword and board martial arts. Downstairs, women, their hips adorned with jingling coin belts, swayed gracefully as they followed teacher Val Kerin in a belly dance class. Upstairs, friends sat and chatted in flowing robes and tunics. When a crier announced loudly that a feast would soon commence, the revelers lined up to fill their bowls with falafel, hummus and chic peas. Afterward, the ensemble Diabolis In Musica played loud, brash tunes as a Gypsy-style dancer, Shekina Shakti, balanced a sword on her head. Even if medieval life could be “nasty, brutish and short,” SCA members say men and women made the most of it despite warfare, plague, and itchy clothing. “In the winter time, it’s anything to get out of the house,” said Sioux Gerow of Everett, who plays recorder, drums and other instruments for Diabolis In Musica. The band, which specializes in folk entertainment rather than courtly ballads, performs at King Richard’s Faire in Carver, and at various medieval and Middle Eastern-themed events. Gerow said the band works to create a genuine sound, but said it’s sometimes necessary to make concessions. Lutes are frightfully expensive, so a guitar will have to suffice, albeit one strung with nylon strings to affect a comparable sound. “If we use amplification, we try to hide it,” Gerow said. The band’s name is attributed to Pope Gregory I, a church ruler of the late sixth century, who, it is said, declared some musical harmonies morally bankrupt and therefore, “diabolis in musica” – the devils’ music. …Some historical researchers complain that SCA members create a distorted perception of period attitudes, events and gender roles. Miller said, most SCA members put great effort into studying the period from which they draw their characters, but said practical considerations sometimes make it impossible to be completely authentic..
For example, it’s much less costly to sew a tunic of cotton rather than linen or wool, which were the most common fabrics in medieval Europe, and to use plastic arrow quills. To learn more, visit www.eastkingdom.org. A new event could take Simmons Island back to ye olden days. Park commissioners unanimously approved the Society for Creative Anachronism to use Simmons Island Park for an event June 12-14. The event is to be a gathering of members of the society to practice medieval arts, sciences and martial activities. Park Division Superintendent Art Strong said he supported giving the group a chance. Strong said he expected about 50 to 100 people at this initial event. Alderman Michael Orth wondered if that number could be a bit low. Strong said this gathering was expected to feature the local chapter of the society. Strong said the event could see similar results to a Simmons Island activity that also looks to the past. Orth said the theme of the event might be a draw for some. “It sounds like this could be neat,” Orth said.